80 percent of hotel closed April, May and June. Avoid booking at this time. They even turn off the air-con in the one restaurant made available. You should be okay around these dates if your happy going to a hotel where the owners do not give a hoot when you book April, May, June. Thomas Cook totally mis-sold our holiday to us. Hotel tip: Lots of places to eat outside resort. Recommend going Bed and Breakfast, ignore half board option. Do not book April, May, June as 80 percent closed with only one restaurant on offer. 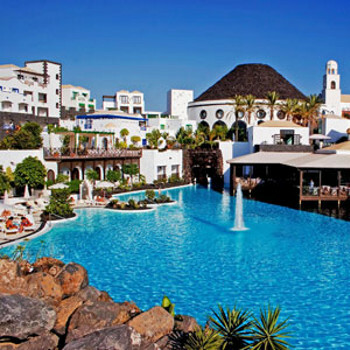 Smashing hotel just a leisurely 20 minute walk from Playa Blanca. Hotel private, peaceful and relaxing. Rooms beautifuly decorated with separate bathroom and loo. Separate seating area in bedroom with balcony/veranda leading off. Upstairs rooms have a decent sized balcony with fantastic views of the marina and Playa Blanca. Only went B&B so can only comment on the breakfast (did not use any of the restaurants) which was first class. Everything from fruit to a good old fry up was available with a chef on hand to cook your eggs and bacon! Staff were friendly and helpful and room service efficient. Entertainment is varied ranging from classical to pop music performances. Would recommend it if you appreciate a bit of privacy and relaxation. First class hotel, would go again! Travel operator: Flight - First Choice Hotel - By phone.